For all marketing leaders, effectively managing your digital marketing budget is a delicate balancing act. Spend too much too early, and you’re running ultra-lean for the balance of the year and risk falling short of your goals. Spend too little, and you’ll likely lose those dollars at year’s end—and perhaps put yourself in a position to see cuts next year if your frugalness is taken out of context. In our experience, we often see organizations slow to spend the first nine months of the year and eager to spend in the final quarter. So, if you’ll soon find yourself in the “use it or lose it” position, absolutely use it—but be thoughtful. How and where should you allocate those dollars? Ultimately, your overall marketing goals and strategy should be your guide. But other factors to consider are projected resource constraints, upcoming and future events you’ll be attending or hosting, planned campaigns, and internal expertise. Regardless of the size of your dollar surplus, there are several ways to make the most of it, gain some end-of-year momentum, and set yourself up for more success in the coming year. What are they? Let’s dive in. #1 – Invest in a content audit. As TopRank Marketing CEO Lee Odden has often said: “Content isn’t king. It’s the kingdom.” So, chances are, many of your budgetary resources have been allocated to creating top-notch content such as blogs, robust resource pages, or larger assets like eBooks or white papers. As a result, you have a lot of content. But where are the gaps? What should be killed, kept as is, or updated? A content audit can provide answers here, allowing you to prioritize low-hanging fruit opportunities, refine your 2019 content strategy, and more. [bctt tweet=”Where are the gaps? What should be killed, kept as is, or updated? A #content audit can provide answers here. – @Alexis5484 #MarketingBudgets” username=”toprank”] Depending on the scope of the audit, (e.g blog content only vs. full site audit) this can be one of the most cost effective uses of your budget. #2 – Conduct a competitive audit. There’s little doubt that you’re keeping a close eye on what your competitors are doing, but when’s the last time you took a more detailed deep dive into their activities or position in the marketplace? Better yet, have you had a chance to dig into those who are on the rise? A competitive audit—which can be simple yet insightful (e.g. social only audit) or more robust—can refresh your view and surface insights that were not on your radar. #3 – Experiment with new content types. An important note when it comes to podcasts: Podcasts do require a more significant investment of time, money, and resources. However, they also have the potential to be a staple offering that your audience comes back to again and again. #4 – Build up your library of original photos. From social media promotion to blog post header images, many marketing departments often rely on stock photo sites for their image needs. Typically, there’s either no time, no budget, no designer—or a combination of all three—to create custom imagery. So, why not use some of those extra dollars to create a library of eye-catching, unique photos to add some pizzazz to your written content? #5 – Put paid spend behind your best content. #6 – Add new tools or subscriptions to your technology stack. These days, I think it’s safe to say that every marketer uses tools and technology to make their jobs easier and their marketing more effective. If there’s a new one you’ve had your eye on, this is the perfect time to invest in a tool which will drive value throughout 2019. Don’t jump right to purchase, however. Nearly every software tool offers demos, free trials, or free versions that you can try before you buy. If you find one you want to test for the long-term, many offer a on-time payment, rather than a monthly option. #7 – Conduct original research. Original research has a myriad of benefits. Not only does it allow you to uncover meaningful data about the pain points, attitudes, and insights of your audience, but also enables you to create a credible piece of pillar content that resonates. Like podcasts, this certainly isn’t an initiative to take lightly. For the last two years, we’ve helped our friends at DivvyHQ compile the Content Planning Report. So, take it from us: It’s resource and time intensive, but the reward can be big as you continue to refine each year and become sticky in the content landscape. #8 – Collaborate to co-create content with influential voices. People trust people over brands. So, if you have extra budget, why not use that to collaborate with industry influencers or thought leaders to create credible, insightful content? This could be a series of long-form interviews or a more robust campaign with assets large and small. Over the last two years, this type of content and program has been at the top of the end-of-year spend list for our clients for two reasons: 1) As an agency, we’ve developed relationships with experts in a range of industries and we’re experienced in making new connections. 2) Influencer content has longevity since it can be sliced and diced or rolled into larger assets, and the insights shared often stand the test of time. You’ve worked hard to win your marketing dollars—so make them work for you. Whether you want to build up a stockpile of ready-to-go promotional images or go big with an influencer program, you have cost-effective and extravagant options to make the most of your budget. If you’ve found yourself on the other side of the spectrum—facing a budget cut—don’t panic. Check out this piece for tips to prioritize your marketing efforts after budget cuts. 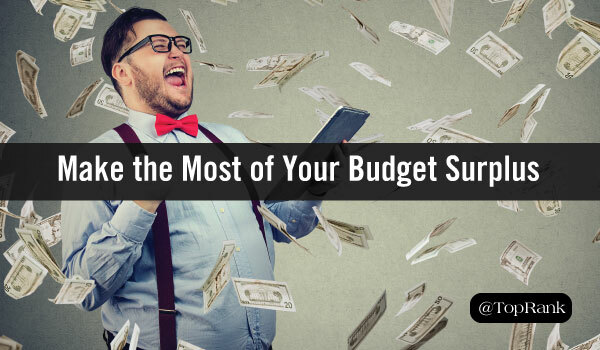 The post Use It or Lose It: 8 Ways to Make the Most of Your Digital Marketing Budget Surplus appeared first on Online Marketing Blog – TopRank®.